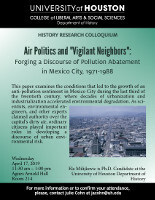 This paper examines the conditions that led to the growth of an anti-pollution sentiment in Mexico City during the last third of the twentieth century, where decades of urbanization and industrialization accelerated environmental degradation. As scientists, environmental engineers, and other experts claimed authority over the capital's dirty air, ordinary citizens played important roles in developing a discourse of urban environmental risk. For more updated feed about the events of the Department of History, follow us on Facebook. 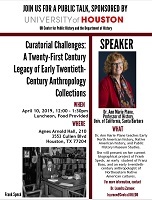 Join us for the kick-off meeting of the History Research Colloquium, a UH collaboration highlighting cutting edge historical research by faculty, graduate students, and visiting scholars. 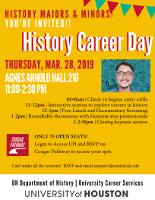 It is co-sponsored by the Center for Public History, the Department of History, the Graduate Program, and Phi Alpha Theta. 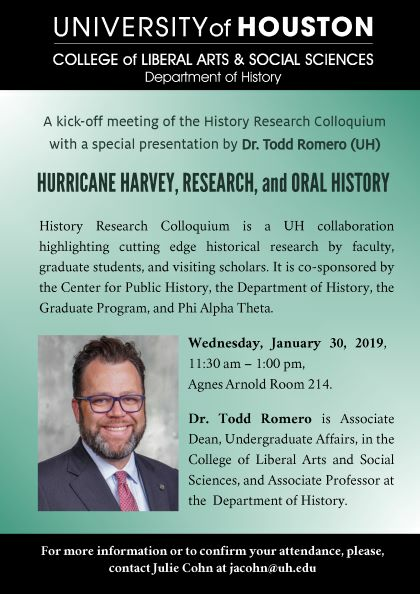 The meeting will have a special Presentation by Dr. Todd Romero on "Hurricane Harvey, Research, and Oral History." For more information or to confirm your attendance, please contact Julie Cohn at jacohn@uh.edu. 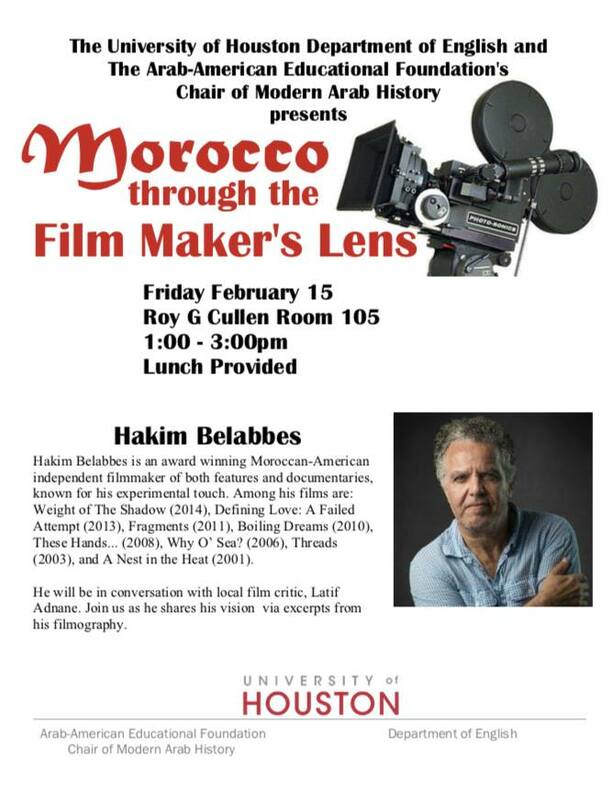 The UH Department of English and the Arab-American Educational Foundation's Chair of Modern Arab History present a conversation between Hakim Belabbes, an award-winning Moroccan-American independent filmmaker, and Latif Adnane, a local flim critic. The College of Liberal Arts and Social Sciences & The Arab-American Education Foundation Chair in Modern Arab History invite you to the Nijad and Zeina Fares Arab-American Educational Foundation Annual Distinguished Lecture in Modern Arab Studies on "The Early History of the Arab-American Community" by Dr. Akram Khater (North Carolina State University). 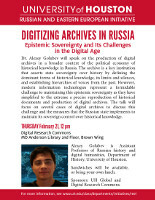 Dr. Golubev will discuss the production of digital archives in a broader context of the political economy of historical knowledge in Russia. The archive is a key institution that asserts state sovereignty over history. It defines the dominant forms of historical knowledge, its limits and silences, establishes hierarchies of voices from the past, and produces experts with authority to interpret its documents. However, modern information and communication technologies represent a formidable challenge to maintaining this epistemic sovereignty as they have simplified to the extreme a precise reproduction of historical documents and production of digital archives. This paper will focus on several cases of digital archives to discuss this challenge and the measures that the Russian state implements to maintain its sovereign control over historical knowledge. Digital Research Commons (MD Anderson Library 2nd Floor, Brown Wing, map). Please join the Ancient World Research Group as PhD student Darah Vann discusses how the #MeToo era has changed both classical reception and her dissertation research. The Ancient World Research Group is organized for students and faculty interested in ancient civilizations and the innovative ways we study them. The discovery of the remains of 95 black inmates at the Imperial Farm Prison in Sugar Land has drawn attention to the history of convict leasing in Texas and the Greater Houston Area. Our speakers will examine this history and the current struggle to honor and memorialize the lives and deaths of these 95 men. 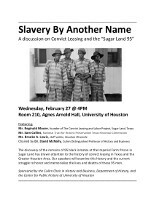 Join us for a panel discussion featuring Mr. Reginald Moore, founder of The Convict Leasing and Labor Project, Sugar Land, Texas; Mr. Sam Collins, National Trust for Historic Preservation Texas Historical Commission; and Ms. Brooke A. Lewis, staff writer, Houston Chronicle. 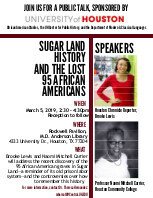 Come join the UH Center for Public History, African American Studies, and the Department of Modern & Classical Languages on March 5th for a special talk by Brooke Lewis (Houston Chronicle) and Naomi Mitchell Carrier (Houston Community College) addressing the recent discovery of the 95 African American graves in Sugar Land—a reminder of its old prison labor system—and the controversies over how to remember this history. 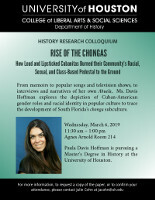 From memoirs to popular songs and television shows, to interviews and narratives of her own Abuela, Ms. Davis Hoffman explores the depiction of Cuban-American gender roles and racial identity in popular culture to trace the development of South Florida’s chonga subculture. 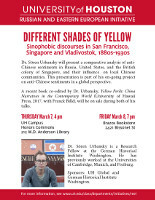 Dr. Urbansky will present a comparative analysis of anti-Chinese sentiments in Russia, United States, and the British colony of Singapore, and their influence on local Chinese communities. A recent book co-edited by Dr. Urbansky, Yellow Perils: China Narratives in the Contemporary World (University of Hawaii Press, 2017, with Franck Billé) will be on sale during the event. Dr. Charlotte Hedenstierna-Jonson has a PhD from the Archaeological Research Laboratory, Stockholm University. With a background in field archaeology and as senior curator at the Swedish History Museum (SHM), she has held research fellowships at SHM, Stockholm University and the Römisch-Germanisches Zentralmuseum (RGZM) in Mainz. Her previous research projects have focused on warfare, identities, mobility and material culture in Late Iron Age – Viking Age societies. Most recently, she has been part of the interdisciplinary ATLAS-project aiming at unraveling human prehistory within present day Sweden by combining archaeology, physical anthropology and genetics. Dr. Selim Kuru (Ph.D., Harvard University) is Associate Professor and Director of the Turkish Studies Program at the University of Washington. He is among the founders of the Ottoman Studies Foundation and run the Intensive Ottoman and Turkish Summer Program in Cunda, Ayvalık, Turkey, where he has been teaching Ottoman Turkish paleography. Dr. Kuru’s work focuses on Ottoman 14th-16th centuries Anatolian literary history, focusing on love and its place in the elite Ottoman society. 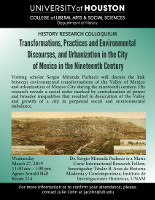 Dr. Sergio Miranda Pacheco, a visiting scholar at UH, will discuss the link between environmental transformations of the Valley of Mexico and urbanization of Mexico City during nineteenth century. His research reveals a social order marked by centralization of power and broader inequalities that resulted in desiccation of the Valley and growth of a city in perpetual social and environmental imbalance. 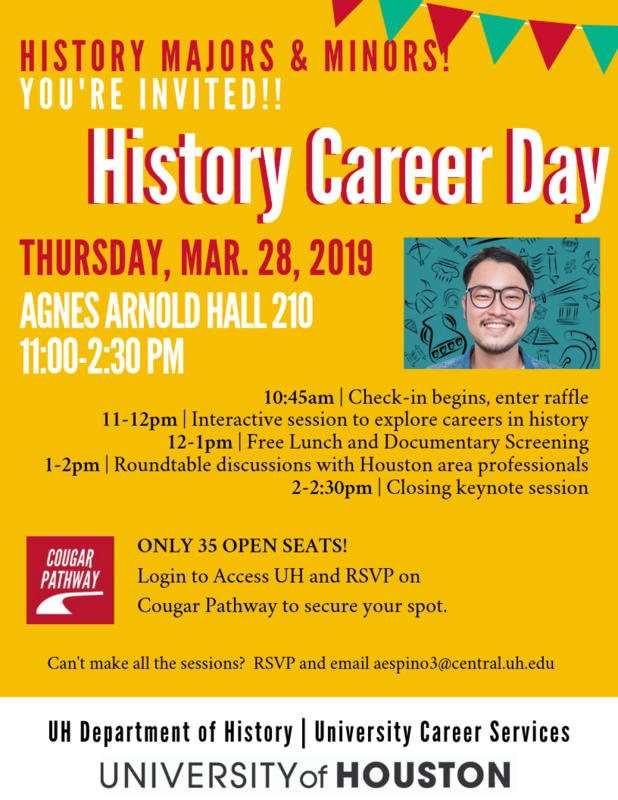 Login to Access UH and RSVP on Cougar Pathway to secure your spot (only 35 open seats). This event will be a collaboration between UH and UHD hosting Dr. Louis A. Pérez, Jr., the Director of the Institute for the Study of the Americas at the University of North Carolina at Chapel Hill. Pérez's principal research interests center on the nineteenth and twentieth-century Caribbean, with a research emphasis on Cuba. Pérez is author of numerous books on Cuban history and culture, including On Becoming Cuban: Identity, Nationality, and Culture and The Structure of Cuban History: Meanings and Purpose of the Past. He is also the winner of Elsa Gloveia Prize, George Perkins Marsh Prize, Guggenheim Fellowship for Humanities: Iberian and Latin American History & 2000 Bolton-Johnson Prize. 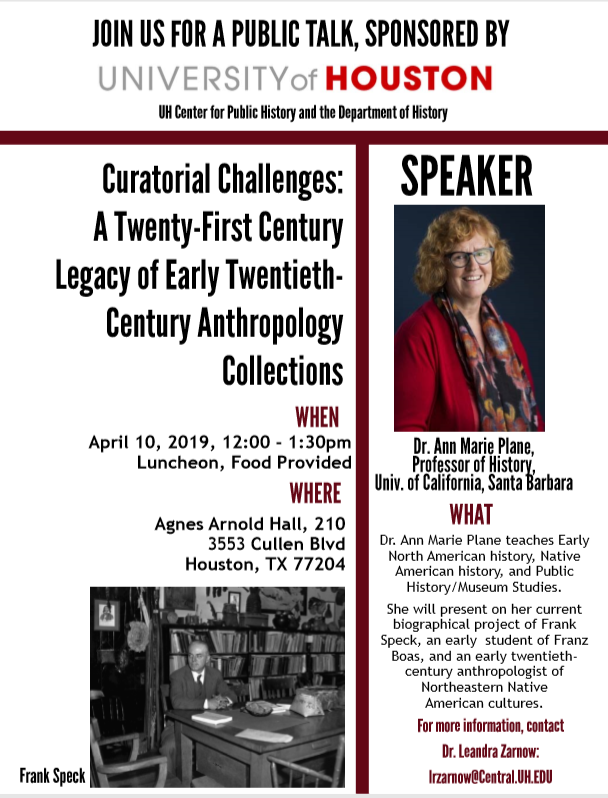 Dr. Plane’s presentation will address issues of curation and public history practice via the work of anthropologist, Frank Speck (1881-1950). Speck’s large collections of Native American artifacts now pose logistical, political, and intellectual challenges for museum curators and scholars, mostly because of sketchy documentation about their origins and the larger political implications of cultural appropriation. Dr. Plane will address the personal and professional meanings of these artifacts for Frank Speck, as well as his methodological approach for procuring and preserving the artifacts. The History Department has produced its Fourth Newsletter! Please keep us up-to-date about your news for future newsletters! Please send your news to the Director of Library and Technology, Professor José Angel Hernández: jahernandez27@uh.edu. Thank you to all who shared news.